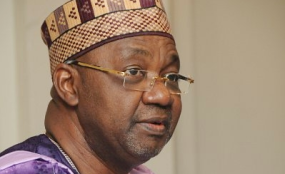 Former Vice-President Namadi Sambo has raised the alarm over the frequent raid on one of his Kaduna residences by operatives of the Independent Corrupt Practices and other Related Offences Commission (ICPC), saying the pace of their invasions portrays a desire to find fault by every means possible. The latest of these raids took place last Wednesday, when the ICPC operatives, along with heavily armed security operatives stormed the house located at No.1 Alimi Road, for a search that lasted about two hours. The ICPC, despite concerns raised by Sambo, has maintained sealed lips on the development. But the police, yesterday, denied having anything to do with the raid on the former Vice President's residence. A statement on Saturday by Umar Sani, spokesman of the former vice-president, stated that the house had been searched five times in the last six months, noting that some of the fittings in the house and other valuables had been damaged in the process. The statement said no incriminating thing was found at the residence, a fact attested to by some of the operatives who carried out the search. Sambo, who, in the statement expressed worry about the rate of search, said it portrayed the desire of a fault-finding mission, adding that it would not be surprising if an incriminating object was planted at the residence in order to willfully and deliberately incriminate him. The former Vice President's statement reads: "In the late afternoon of Wednesday, the 28th of June 2017, the Alimi Road, Kaduna un-occupied residence of the former Vice-President, Arc Mohammed Namadi Sambo, GCON, was invaded by security operatives armed with a search warrant, who conducted a forensic search of the entire residence. "Initially, we were at a loss as to their identity but later discovered that they were operatives from the Independent Corrupt Practices and other related offences Commission (ICPC). It is worthy of note to state that no such brazen attempts were made at any point, either at his Link Road Kaduna residence, or his Abuja apartment, which he presently occupy. "As the visit of the operatives was unscheduled, the reasons for the search were not specifically stated. However, the outcome of the search was made known. At the end of the whole exercise, the officers, who carried out the search were satisfied that nothing incriminating was found. As a law-abiding citizen, the former Vice-President did not raise any alarm in the previous invasions in view of the fact that he has nothing to hide. "The recent desperation exhibited by some security agencies in carrying out a raid on an unoccupied residence blocking all entry and exit points, in a commando-style and coming along with a bullion van speaks volumes of the clandestine intention of the security operatives. "It is therefore worrisome to note that the consistency with which the searches occurred and the intervals between them portray a desire of a fault-finding mission. We are apprehensive that a repeat of such episode will not be surprising if an incriminating object is planted in his residence in order to willfully and deliberately incriminate him. "It is against this background that we wish to draw the attention of the unsuspecting members of the public to this phenomenon. The desperation of some of the security agencies is glaring by the number of times such searches were conducted and still counting. We hope it is not a way to try to give a dog a bad name in order to hang it". Speaking , ICPC Head of Media and Information, Mrs. Rashedaat Okoduwa, refused to comment on the matter. She said that "there is no official response yet" to the allegations and complaints labelled against the agency by the former vice-president. Okoduwa further maintained that "no report emanated from her office" with regards to the search of Sambo's residence in Kaduna. But the Nigerian Police have exonerated themselves from the matter, stating that, at no time did the police participate in the search of Sambo's house. Police Public Relations Officer, CSP Jimoh Moshood, said in Abuja that the Police were not involved. "Those reports of Police involvement are not correct. You know agencies like EFCC and ICPC use Police as their personnel, I can tell you that we are not involved," Moshood stated. The invasion on Sambo's residence has continued since he left office in 2015. In 2016, Sambo's office around Central Area District of Abuja was invaded by the Economic and Financial Crimes Commission (EFCC) in search of incriminating files and documents. As vice-president and Chairman of the National Privatisation Council (NPC), Sambo superintended over the sale of strategic and critical national assets, particularly within the power and rail transport sectors. The Buhari administration has raised eyebrows over some of these contracts.